Brad is proud to be a part of the Palo Alto Challenger League Cardinals. He has coached for three seasons and looks forward to many more. The team—sponsored by the league and the nonprofit Community Association for Rehabilitation—gives the youth a chance to be a part of group activities, just like their brothers and sisters. "For these kids, it's the one day a week where they can feel like other kids. It makes them feel special—and makes them feel ordinary," says Brad. Like young athletes worldwide, the Giants love playing baseball. But unlike many others, the two dozen or so members play in the league's Challenger Division, which the national league created for kids with physical or mental disabilities. Now in its fourth season, the Palo Alto team has taken off like a line drive, growing in numbers as word has spread. There are, naturally, differences between the Challenger Division team and others in the league—ones that go beyond the fact that a few athletes use wheelchairs. The division accepts all skill levels. 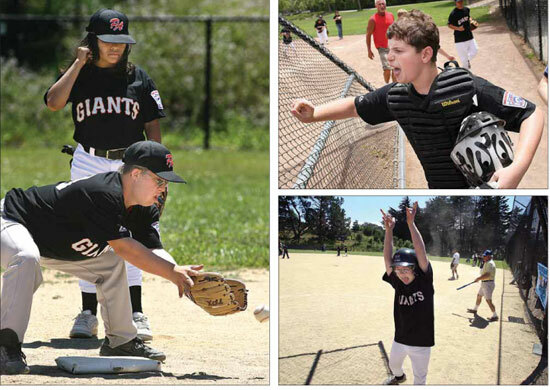 Competing against other leagues' Challenger groups, the Giants travel throughout the Bay Area. Games are two innings long. All players bat and run the bases. There are no outs; no one keeps score.